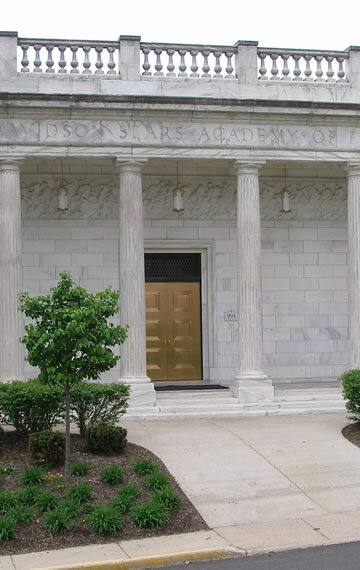 This neo-classical structure on the campus of Elgin Academy was built in 1924 with funds donated by Judge Nathanial Sears and his wife Laura Davidson Sears. Mrs. Sears was the first graduate of the Academy in 1872 and later became a teacher and a trustee at the school as well as one of its greatest benefactors. The donation of this building (at a 1924 cost of approximately $150,000) was just one of the couple’s numerous and generous gifts to the “school on the hill” that they both loved so dearly. The structure, designed by architect Fred B. Schmidt, is of marble and brick with Doric columns stretching across the portico. The low relief frieze at the top of the portico is a replica of the frieze on the Parthenon in Athens. The Gallery was built to house an extensive art collection much of which was donated to the school by the Sears Family. Originally all of the rooms, including the octagonal foyer, displayed the art collection which was considered one of the finest in the Midwest. The Laura Davidson Sears Academy of Fine Art, as the building was called at that time, was a working museum run by a curator and open to the public on a limited basis. Eventually, portions of the art gallery were renovated for use as the school’s theatre and backstage area. 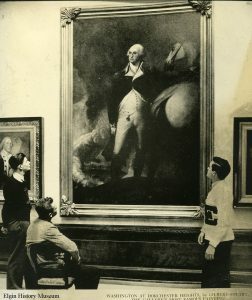 Today the Washington Room, named for the large portrait of Washington at Dorchester Heights which dominates the space, houses items from the Academy’s permanent art collection as well as a 24ft. panoramic photo display of the east side of Elgin taken in 1866. The Washington Room serves as a meeting room and gathering space for the Elgin Academy community.